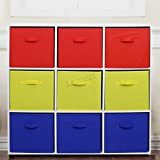 BOYS TOY STORAGE UNIT - This brilliant Paw Patrol kids toy storage unit is an officially licensed 2 tier, 3 drawer organiser measuring overall 60 x 53 x 30cm/24" x 21" x 12" (H x W x D). 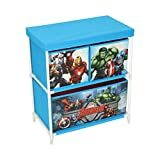 Light blue in colour it is an ideal boys toy storage solution, a lovely piece of furniture for a childs playroom, bedroom or even your own living room. 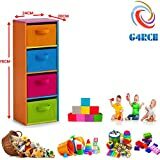 Encourages putting toys away at the end of the day, turning a chore into an enjoyable activity whilst tidying and reclaiming your living space. CHASE, RYDER AND FRIENDS - Top section has two smaller 21 x 24 x 29 cm/8.3" x 16.5" x 11.4" baskets with Marshall and Rocky in action poses. Bottom has a larger 22 x 48 x 31cm/8.7" x 19" x 12.2" basket with Ryder, Chase, Rubble, Skye and Zuma. All three baskets have Adventure Bay and The Lookout in the background plus colour coordinated, stylish black interiors to the sides and base. 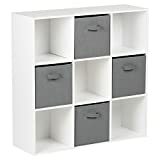 STRONG, LIGHTWEIGHT AND SAFE - All drawers, stretchers and unit top are fabric covered in 100% woven polypropylene canvas. Combined with the main frame of the storage unit - a series of interconnected hollow metal poles this gives a good amount of strength while remaining lightweight & safe at only 1.8KG. 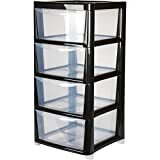 All materials used are hard wearing, stain resistant and easy to clean with a soft, damp cloth. 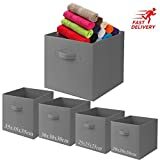 Each drawer liner even features a fabric loop for quick removal. 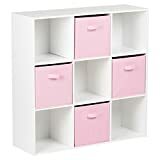 REALLY EASY TO ASSEMBLE: This kids storage unit is very easy to put together, requires no tools as all parts simply push or securely slot together. Can be assembled by an adult in around 5-10 minutes, it is strong and safe, the drawers are easily accessed by children and it looks colourful and attractive. 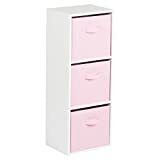 Can be moved around with ease by an adult. Full assembly instruction sheet included in the box. 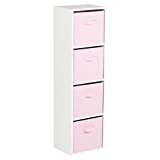 DIMENSIONS/PACKAGING: Your new childrens storage weighs approx 1.8KG fully assembled and measures overall 60 x 53 x 30cm/24" x 21" x 12" (H x W x D). Supplied flat packed, boxed in attractive, colourful, branded packaging. 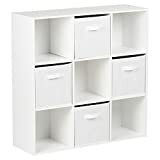 Contains: 4 x Plastic Feet/Three Way Corners, 8 x Four Way Plastic Connectors, 4 x 28cm Metal Poles, 10 x 26cm Metal Poles, 6 x Long 49cm Metal Poles, 2 x Smaller Single Drawers with Liners, 1 x Large Drawer with Liner, 2 x Fabric Stretchers, 1 x Top Cover and Assembly Sheet. 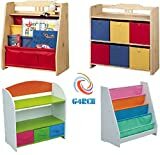 Made of E1-grade MDF board and non-woven fabrics Eco-friendly and solid design, the frame is designed with rounded edges for the safety of any age of kids. 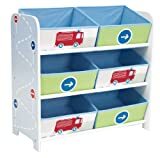 This child suitable height storage unit provides easy access to books and toys for children ages 3 and up, promotes organization and reading skills. 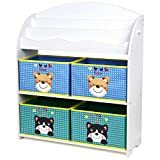 4 Non-woven fabric drawers with cartoon animal patterns are cute and appealing to kids,offer ample storage room for different toys such as blocks, crayons, toy trucks, dolls, etc. 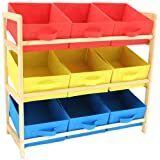 Perfect storage solution for books and toys, suitable for use by children older than 3 years old, helps reduce clutter and enjoy a neat and organized room.